We’re almost there – one week to go and Christmas will be upon us! To date I have not bought a single present, nor I have I given any thought to what I will be serving at Christmas Eve drinks or Christmas Day brunch – bloody hell, this is very uncharacteristic, and adding to my current frenzied state of mind. Meanwhile I have a Cuisine magazine party tonight (I’m taking a dessert – also not planned), a week of meetings coming up, including the Dish magazine party (it’s the festive season for sure) and will thankfully be getting the stitches out from three moles I had removed last week by Friday. I couldn’t care less about scarring or the slight pain associated with the excisions, I am crossing my fingers for no more melanoma-news (obvs), but not being able to go to yoga or have lovely big baths is really doing my head in. But I know it’ll all be OK – I will think of dessert shortly (South American themed…maybe bitter dark chocolate/dulce de leche swirl ice cream with toasted almond crumble in mini waffle cones…also quite summery and festive? 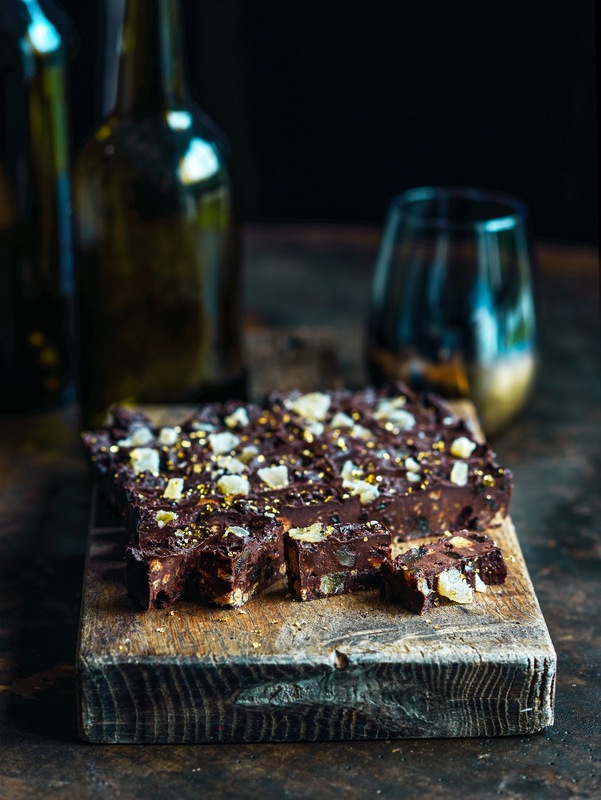 ), make some Christmas lists (gift vouchers galore), Christmas Eve – a big platter of buffalo mozzarella, prosciutto, basil and olive oil with mushroom bruschetta, pesto pizza bites, smoked fish arancini with lemon aioli and this fudge slice for dessert. Brunch of berry bircher muesli, salmon and salad as per my latest Dish spread…haha, right – bloody sorted!!! Have a great weekend – and if you’re scratching your head for a sweety-treaty gift to give at this time of year – this slice packed with whiskey-soaked sultanas, ginger, dark chocolate and gingernuts is quick, easy and mega-rich. The gold flakes (if your local gourmet food store has some) are really expensive but you only need a tiny sprinkle, they look a bit flash, and they last for ever!Right, can’t go to yoga (sniff), but I can go for a walk…have a great weekend…falalalala…. Put the sultanas, whiskey and zest in a container, give it a good stir around, then cover and leave it over night. Line an 18cm x 20cm slice tin with baking paper. Put the chocolate in a bowl over a saucepan of simmering water. Add the sweetened condensed milk and cream and whisk gently as it melts, until smooth. While the chocolate is melting put the gingernuts in a sealed plastic bag and take to it with a rolling pin – basically smash them into small broken pieces. Add the broken biscuits, sultanas (and any soaking whiskey), and ginger to the chocolate and stir to combine, then pour into the tin. Flatten out a bit then top with the reserved ginger. Leave to cool in the fridge for 4 hours or overnight, then slice into pieces – it is super rich, so I cut mine into 32 small slices. Decorate with gold flakes if desired. Beautiful… Both words and recipe ;)I come to your blog to drool at your photos and most importantly read your content. Tasted every bit as delicious as it sounds! And works well with bourbon too (if the grog cupboard is looking a bit sad)! Thanks! It is delicious. Thank you for the recipe. I Love this cake is very awesome and decoration good job my friend. Sounds yum, except i dont like sultanas – what could i add instead? Craisins?? ?